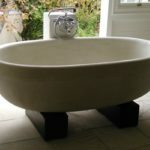 The Standard Stonecast showertray is 900 x 900 x 120 h. It is cast in solid white concrete that resembles natural cut Sandstone or in Pale or dark Charcoal Grey Concrete for a more contemporary urban industrial look. It must be fitted with a central waste. Our Showertrays are all steel reinforced and are sealed with a high quality PU sealer which prevents staining and facilitates cleaning. These showertrays are ideal for use on wooden floors as there is no flexibility in the material. Channel rebates , to house the glass wall panels, can be incorporated where desired. 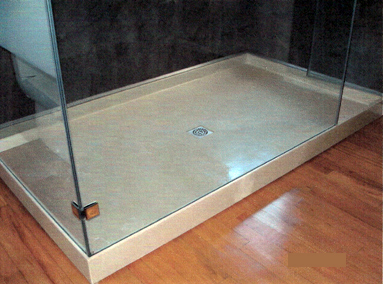 We also custom manufacture Showertrays to specified dimensions and design. These are all for quotation only. After detailed discussions with the client we decide which materials are best for manufacture. For Showertrays that need to be lightweight we use reinforced fibreglass with a cut Sandstone finish. When weight is not too much of a problem we use a sprayed cement system called GRC ( Glass reinforced cement ) and where weight is not an issue we cast concrete, but delivery access must be facilitated. Where the showertray must be raised up in order to house the showertrap, a cast cover panel in matching material is supplied to hide the cavity.